Figure 1 shows tabs that you can use to quickly see tweets in a particular group. Twitter’s increasing popularity has gotten many people on board and using the web application. With the growing number of active users comes the need for following more people. The ability to create groups (or categories) of Twitter users that you follow can reduce the noise in your Twitter feed and can help you immediately see updates from particular groups of users. For example, having a group for “co-workers” or “local tweeters” can help you quickly see what your co-workers are saying or find up-to-the-minute information on local events such as traffic accidents. Twitter is a great source of information and is a wonderful forum for discussing various topics. 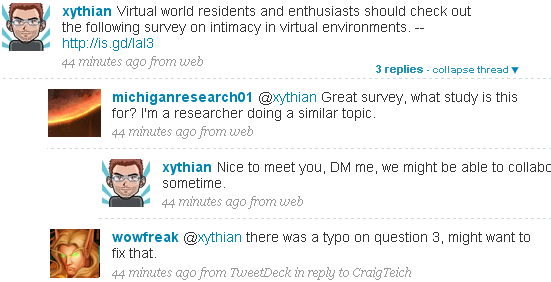 Unfortunately, the current user interface doesn’t allow you to easily view a conversation between two or more people. Figure 3 show how threaded comments could look. Coupled with the “reply to” feature in the current user interface, threaded tweets can give users the chance to participate in (or follow along with) conversations taking place in several Twitter feeds. Threaded tweets can also serve as a means for people to find other Twitter users that are interested in similar subjects of conversation. Figure 4 shows a possible syntax for tweets directed to a group of users using a double @ synax. @@friends I’ll be a little late for our lunch date, start ordering without me. The double @ serves to differentiate a tweet directed to a single user from one that’s directed to a group of users. A tooltip is an effective graphical user interface element that allows users to view more information when they hover or click on a text or object of interest without having to leave the current web page. They enable information-gathering with fewer clicks and fewer pages to visit. One way tooltips can be helpful is in seeing the bio information of a Twitter user when you hover over their username on your Twitter feed. If you see a username mentioned in an interesting Twitter update, simply hover over the name to see more information about the user that was mentioned. 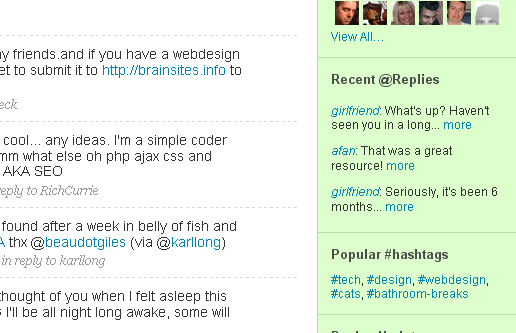 Figure 5 shows a “Recent @Replies” and “Popular #hashtags” section on the side bar. Twitter can utilize the right sidebar more effectively by showing relevant information and statistics. For example, a “Most Recent Replies” section or a “Most Used #hashtags” section can be very helpful in showcasing the latest activities and the hottest topics. Figure 6 shows the first tweet as being highlighted, and the second tweet being deemphasized. The third tweet is how tweets normally look like in the current interface. Users who follow many people run into the trouble of Twitter feed overload where there’s just too much going on and too many tweets to read. The ability to mark favorite Twitter users, as well as deemphasize users that you don’t care much about (but still want to follow for some reason), can give users better visual queues on what to pay attention to first when perusing one’s Twitter feed. With Twitter’s current user interface, hyperlinks are counted towards your 140 character count limit even if it gets reduced in length by a URL-shortening service like TinyURL.com after you hit the “Update” button. One way to allow users to enter more text – without having to go to another website just to shorten URL’s – is to have a built-in URL-shortening feature. This would not only save user’s some time, but also eliminates the need to rely on other websites to perform an action that should really be handled within the system. U.S. ambassador to South Korea Harry Harris. (Yonhap)SEOUL, Jan. 22 (Korea Bizwire) — Harry Harris, the U.S. ambassador to South Korea, has apparently come to the fore in Washington’s call for more money from Seoul for its troops here, potentially taking a toll on Washington’s public diplomacy [JB emphasis] with its key regional ally. The two sides have been in a tug-of-war over how much Seoul should pay for the presence of the 28,500-strong U.S. Forces Korea (USFK).Despite ten rounds of negotiations led by veteran diplomats last year, they failed to strike a deal.The Trump administration demands South Korea sharply increase its burden from the current 960 billion won (US$850 million) a year. A related five-year contract expired at the end of 2018.Amid a protracted stalemate in the talks, Harris visited the presidential office, Cheong Wa Dae, in late December to discuss the issue, according to The Dong-A Ilbo, a Seoul-based daily.He met with National Sec..